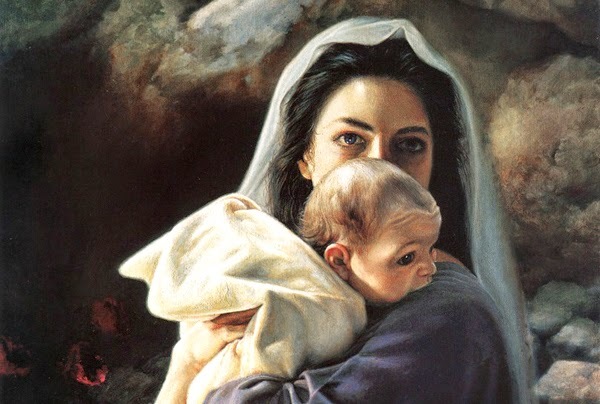 Mary was not oblivious to Christ's importance to our fallen world. She knew. She knew that her son, God's Son, would take on our iniquities and bear our sorrows. She was solid in her faith, her testimony, and her purpose in raising and caring for this precious child. She said: "My soul doth magnify the Lord, And my spirit hath rejoiced in God my Saviour. For he hath regarded the low estate of his handmaiden: for, behold, from henceforth all generations shall call me blessed." I believe (granted, this is my opinion only) that it is demeaning to Mary to ponder her proposed ignorance at the greatness of her Son. Each time the song "Mary, Did You Know?" wonders if Mary knows something about Christ, I want to shake my laptop and shout in her proxy: "YES! YES, I KNOW! YES, I KNOW, DANGIT!" I am obsessed with women in the Bible, and always have been, because finding a woman in the Bible is like finding a million dollar bill on the beach or a leftover Torchy's Taco in the fridge. It is rare and exciting. How can I help but have a natural curiosity about, to pieces, all of the Biblical womens? I've gotta find my role models somewhere. You have your Ruth and your Esther. Your Mary and your Mary and your Martha. Lazarus had a daughter, right? There was an adulterer who could no longer find her accusers. Lydia was a convert who sold purple cloth. Rahab, the harlot, who hid Joshua's spies, happened to be an ancestor of Jesus. Paul honorably mentions Eunice, who is Timothy's mother, and Lois, who is Tim's grandmother. Do not overlook the impoverished widow who fed Elijah. Rachel. Leah. Hannah. Hagar. Sarah. And, last but not least, my favorite female duo: Shiprah and Puah. Have you heard of them? Probably not, but they are more than worthy of being remembered, so let me shed some light on their amazingness. Shiprah and Puah (Exodus 1) were Hebrew midwives in Egypt, ordered by Pharoah to kill all of the male children being born to the Hebrew women. "But the midwives feared God, and did not as the king of Egypt commanded them, but saved the men children alive." I love that story because Shiprah and Puah definitely stick it to the man. We can learn so much from their stellar examples of courageous living. We all should be like them. I sometimes wonder how we, as a society, could have allowed something as terrible as the Holocaust to happen in our world. How could an entire population become hypnotized and fall victim to the evil, unjust will of a twisted man? You can bet your boots that Shiprah and Puah would not have let Hitler push them around. Right is right, wrong is wrong, no 'buts' about it. In conclusion, even though the ladies of the Bible only fill a miniscule amount of its verses, I believe with all of my heart that there will be thousands of stories starring faithful, freakin'-awesome Bible-women that we will be able to read about in heaven. Yes, a whole buttload of unwritten pages will eventually be found Upstairs. Most importantly, God has a plan for each of us, regardless if we are male or female, regardless if we are heralded or hidden, regardless if we are esteemed or forgotten. He has assigned us individually with a work that no other can do. Just like Mary, he prepares us. Just like Mary, if we realize his grace in the process, we will be enabled to react by magnifying our lives in worship and praise of our Lord. When asked if we know if Jesus is the Son of God, we can respond, resoundingly: "Yes. Of course." Melissa Condie is a middle school orchestra teacher in Houston, Texas. She loves jalapeño chips, passion fruit smoothies, MS Paint, and the smell of desert rain. She also has a blog: Tacky Galoshes. Image credit: Be It Unto Me by Liz Lemon Swindle.